ip-label’s new mobile application is available at present on App Store and Google Play. You can now monitor your web and business applications or websites directly on your smartphone. With our Datametrie-compatible application (and Newtest-compatible application, coming soon), check up on the status of the user journeys monitored by ip-label. At a glance, you can view the vitals of all of your monitored applications under the ‘Console’ tab. You can also receive push notifications in the event of an alert, and identify which step in the journey failed. 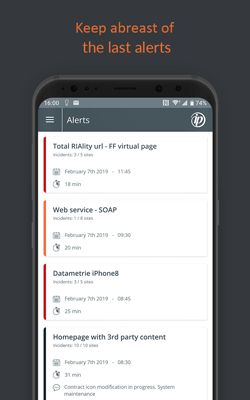 Alerts can also be sorted by their level of criticality so you can give priority to the treatment of the most critical alerts.